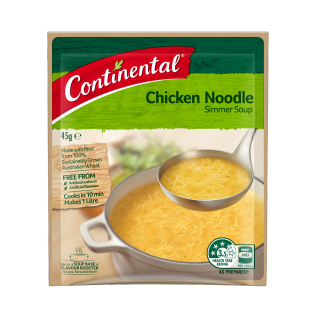 Try Continental Chicken Noodle Simmer Soup for a tasty snack and meal, or try one of our great recipes with it! Noodles (wheat^ flour, wheat gluten), salt, sugar, mineral salt (potassium chloride), yeast extract, flavour enhancers (621, 635), chicken (1.8%), sunflower oil, natural chicken flavours, onion powder, natural colour (turmeric), parsley, burnt sugar, spices (celery seed, black pepper), food acid (lactic), herb extract. Allergens:Contains wheat products. Made on equipment that also processes products containing milk, soybean, peanut, egg, sesame, fish and crustacea. Stove top 1. Place 4 cups (1 litre) of water into a saucepan and bring to the boil. 2. Stir until boiling then simmer for 5 minutes, stirring occasionally.